MILWAUKEE (AP) — Wisconsin Gov. Scott Walker has raised more than $25 million to defend his job, drawing heavily from prominent GOP players outside the state and dwarfing the amounts raised by his Democratic challengers. Other groups are contributing millions more in advertising. And Walker has leading Republicans campaigning for him, including New Jersey Gov. Chris Christie. The governor's fundraising firepower and his broad support among the GOP elite illustrate the challenge facing his opponents. The Democrats who swarmed the state Capitol last year to protest Walker's assault on public unions now have only a month before a historic recall election to counterpunch Republicans who have rallied strongly behind their Wisconsin superstar. In a sign of how easy it's been for Walker to raise money, his top eight donors accounted for $1.5 million. The two Democratic front-runners raised $1.8 million combined. An unprecedented amount of cash — about two-thirds of Walker's campaign haul in the last report — came from outside the state. "That's a level of outside influence we've never seen before," said Mike McCabe, executive director of the government-watchdog group Wisconsin Democracy Campaign. "He's been all over the country raising money." Democratic challenger Kathleen Falk, a former Dane County executive, got plenty of out-of-state support as well. Of the $977,000 she raised between Jan. 1 and last week, nearly $449,000, or 45 percent, came from outside Wisconsin. Another $25,000 came from donors who listed no state in their address. Her chief rival in the Democratic primary, Milwaukee Mayor Tom Barrett, raised $831,500 during that same span. Eleven percent, or $92,600, came from out-of-state. Democrats are counting on an electorate that they say is every bit as energized now as when massive crowds of demonstrators descended on Madison last year in response to Walker's effort to end collective-bargaining rights for most public employees. Walker, who ultimately prevailed in the confrontation, said he acted to help the state deal with its budget deficit. But Democrats saw the changes as an all-out attack on unions, one of their key constituencies. Unions and others had little trouble gathering more than 900,000 signatures to authorize a recall election for Walker. 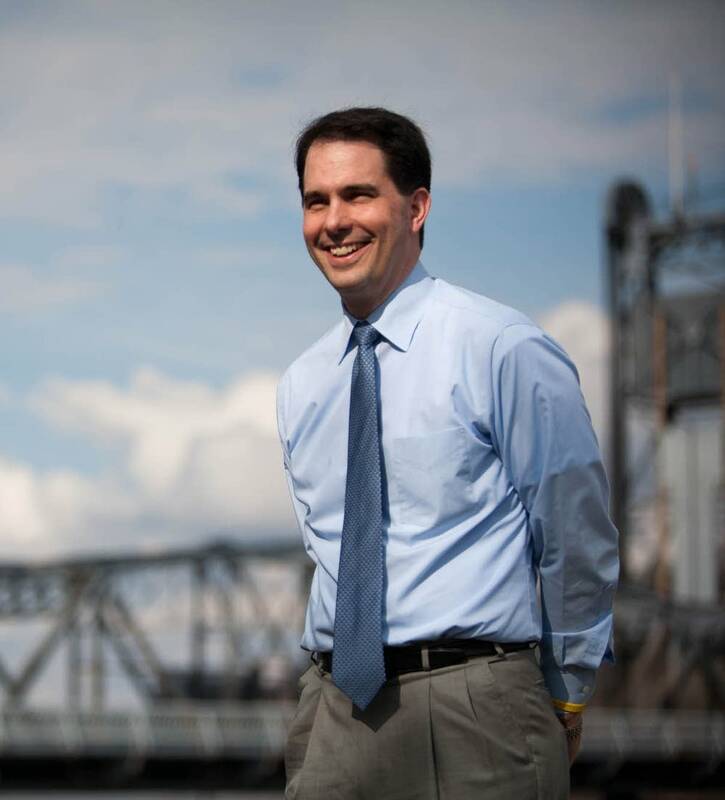 However, Walker took advantage of a quirk in state law to raise $13.1 million between Jan. 18 and last week. State law forbids individuals from donating a total of more than $10,000 in a given year, unless the money goes to a recall campaign during the time when the campaign can accept unlimited donations. For Walker, that window lasted nearly five months. Falk, Barrett and two other Democrats square off in a primary May 8. The winner takes on Walker in the June 5 recall election. No one on the Democratic side has star power comparable to Walker's status in the GOP. And Democrats shouldn't expect any help from President Barack Obama. Aides to Obama's campaign said the president was not scheduled to campaign in Wisconsin ahead of the recall vote. Sachin Chheda, a Democratic strategist who hasn't endorsed any candidate, said Democrats are not worried about matching Walker's spending. "The question is not whether they have as much as Walker. It's do they have enough to get their message out," Chheda said. "I think they do." Walker defeated Barrett in 2010 by 5 percentage points. A poll released just days before Barrett got into the race this year showed him leading Falk 36 percent to 29 percent among surveyed voters, with 17 percent undecided. Both Democrats were about even with Walker. The party that wins the recall election will likely be the one that's more successful at getting out the vote. Money might not have as much sway in this election because most voters seem polarized, with strong feelings for or against Walker that aren't likely to be influenced by TV ads. That doesn't mean there won't be plenty of commercials. Outside group have already been spending millions on both sides, in about even amounts, McCabe said. "It looks to me like there will be rough parity in spending between the parties," he said. "But there's no way on earth any (Democratic) candidate is going to close the gap" in personal fundraising given Walker's commanding financial advantage. Wisconsin for Falk has spent more than $4 million on advertising, and an independent group called Greater Wisconsin has spent several million dollars, McCabe said. On the Republican side, Americans for Prosperity has given more than $3 million and the Republican Governors Association more than $1 million. A group called Wisconsin Manufacturers and Commerce has spent about $2 million, he said. The numbers are vague because groups don't always have to report their full spending, he noted. Labor groups including the American Federation of State, County and Municipal Employees, the nation's largest public-employee union, have been contributing money to Greater Wisconsin. The groups say their edge is with activists on the ground who are knocking on doors and coordinating get-out-the-vote efforts. "The one thing unions are very experienced in is organizing in local communities," said Jeff Zack of the International Association of Firefighters, which is organizing members in Wisconsin and began airing advertisements Tuesday. Likewise, AFSCME has opened 17 regional offices in Wisconsin to help organize its members. Walker has sought help from fellow rising Republican stars such as Christie, who joined him Tuesday on the campaign trail. The arrangement helps Walker raise money and gives visitors an opportunity to burnish their conservative credentials. — — — Beaumont reported from Des Moines, Iowa. Associated Press Writer Todd Richmond in Madison, Wis., and Troy Thibodeaux in New Orleans contributed to this report.